Located in the historical area of San Vicente de la Sonsierra, in the hill to a marvellous castle and to the church of Santa Maria la Mayor (national heritage). 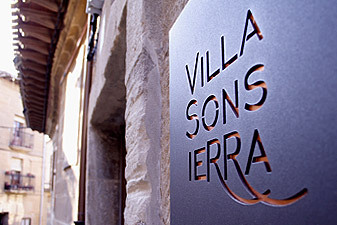 The hotel, inaugurated in July 2008, is located in the region of the Sonsierra (High Rioja), where almost the 100% of the population are dedicated to the culture of the grapevine and the elaboration of best wines of Rioja (a worldwide well-know wines). The owners, a young couple with large experience on Hotel services, have rehabilitated a traditional building to turn it into a tourist supply dedicated to the enoturismo. Come to visit us and enjoy of such a peaceful and wonderful place.